Looking to add some friendly competition to your next holiday gathering? Our King of the Mountain Inflatable is just what you are looking for! This winter themed inflatable features colorful evergreens and a snow capped mountain. Competitors have plenty of jumping room as they try to see who can get to the top of the �mountain� first or who can stay on the �mountain� the longest! Whether you are hosting an office holiday party, a holiday-themed fun fair, or other school event, the King of the Mountain inflatable will be the centerpiece of your party! Guests young and old will have hours of fun with this exciting inflatable! Let AMJSE take care of all the work - we will deliver, set-up, and take down your King of the Mountain Inflatable, so all you have to do is enjoy! 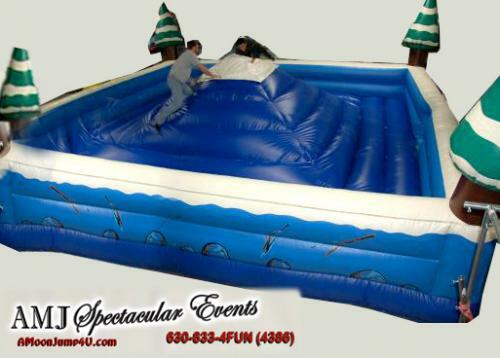 Contact us now to talk about this, other inflatables, or about the hundreds of other rentals we have ready to help make your holiday party a spectacular event! See who can stay on top of the mountain the longest! I AM KING (or QUEEN) OF THIS MOUNTAIN!